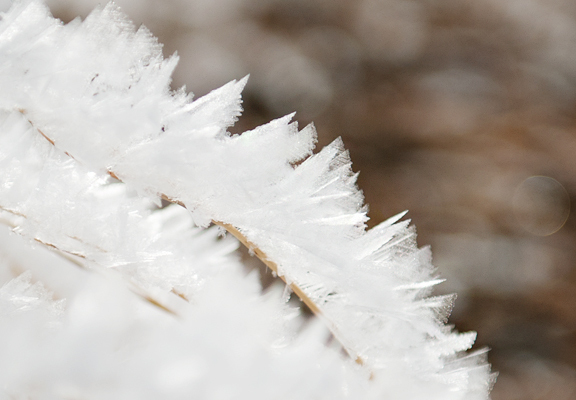 Each day last week listed snow in the weather forecast for Crested Butte. That was mostly a good thing. Mostly. It was time for us to head back home for stuff like work and sanity, although we are only able to be in Crested Butte because of the internet (and the ability to work online). At first we thought we might be able to get home Thursday, then it looked more like Saturday. Well, I’m glad we didn’t plan to leave Thursday because that was (yet another) powder day. 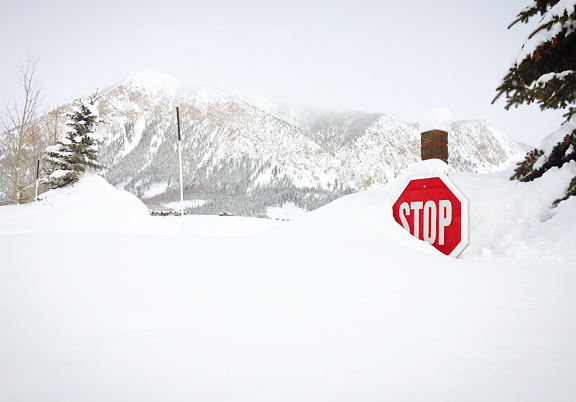 Remember how Crested Butte got four feet of snow the first week of January? They received another five feet in the second week of January. Do the math. 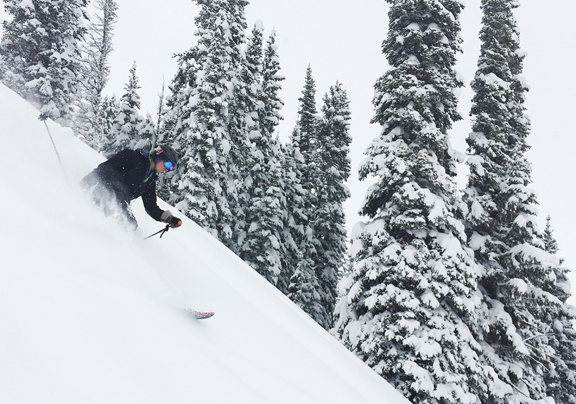 Four feet plus five feet equals some of the best powder skiing ever. The plan was to ski Friday morning if the mountain received 6 inches or more overnight or to skin up the mountain if it was less. I awoke at 5 am when Neva kicked me in her sleep (she starts off in her bed, but always winds up on ours in the middle of the night). The mountain reported a few inches. I checked the pow cam, then three different weather forecasts. Our window of least snow had moved up a day. I woke Jeremy and we discussed our options in the dark as Neva began to petition for dinner (breakfast). If we wanted to leave that day, there was much to do in order to button up the place – wash towels and linens, vacuum, sweep, mop, scrub the kitchen, dishes, empty the refrigerator, clean bathrooms, dust, take trash and recycling to the dump, pack up, unplug, clear snow off the middle eaves. Six hours later, we were on the road. Five hours after that, we were home. 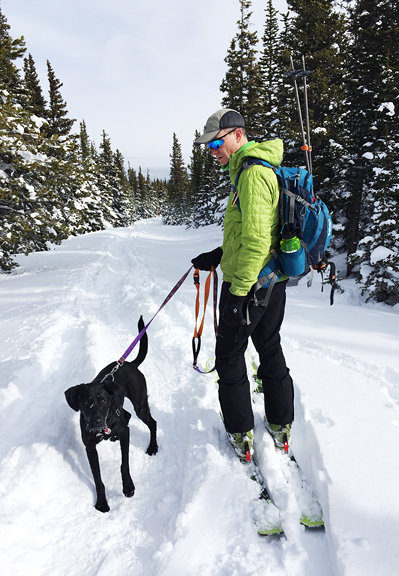 We spent a glorious month in Crested Butte, which is the longest we’ve been there in one go. Jeremy didn’t think I could do it because I usually start to lose my marbles after 2+ weeks, but I managed. Barely. 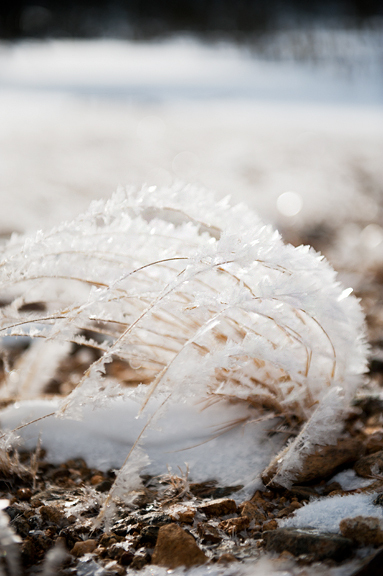 As much as I love Crested Butte – and I really do love it – I get more done in Nederland. Thankfully, we were greeted with fresh snow and a calm atmosphere. Positively the best weather the Front Range can offer between November and April. Living in Gale Force Wind Central, you learn not to take days like that for granted. So we got out to enjoy this otherworldly (some might call it the Upside Down) version of home. 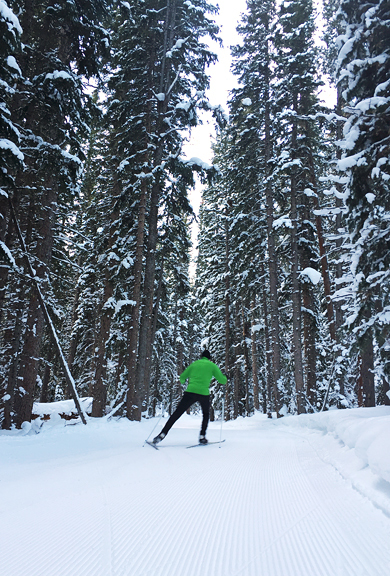 The first order of business was to ski, because exercise keeps us all nice nice. The second order of business was to cook. Chinese New Year’s Eve is Friday, January 27th. 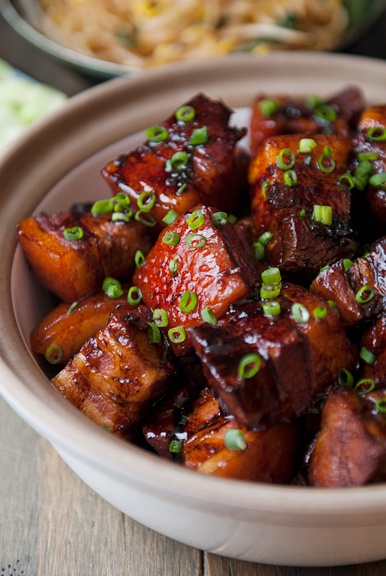 I perused my list of “want to make” Chinese recipes and settled on red-cooked pork (hong shao rou). When I was little, my grandma and parents made it with a bone-in, skin-on pork shoulder cooked super tender and infused with the flavors of the heady, savory braising liquid. If you search online recipes, you will discover that most people are cooking with pork belly these days, which is far more luxurious than a humble pedestrian pork shoulder (but let’s all agree that pork shoulder is a truly wonderful cut). It’s best to get pork belly with the skin on, which my local Whole Foods doesn’t have. As my mom complained this summer, “They trim the skin off the pork belly – that’s the best part!” If your local Asian grocer has a butcher’s counter, then you can probably score skin-on (maybe even bone-in) pork belly. That’s what you want. 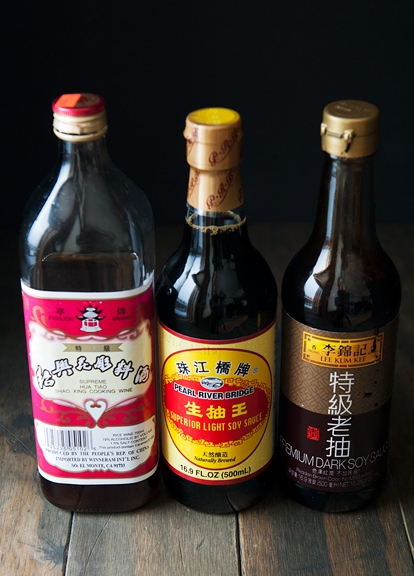 Other ingredients you should pick up while you’re at the Asian market are: Shaoxing cooking wine, light soy sauce, and dark soy sauce. Shaoxing is also known as huang jiu (yellow wine), but you can substitute dry sherry in its place. If you can’t find light soy sauce, using your regular soy sauce should work. 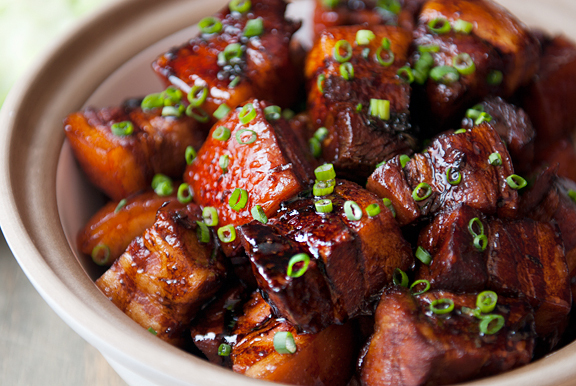 The dark soy sauce is different though – it’s less salty, has a sweet finish, and adds a deep, rich color to the dish. While researching recipes, I decided to go with the one that was the most straightforward. But it didn’t include ginger, which was in another recipe I liked. In these instances, the only solution is to consult with Mom. We exchanged a few texts and I was off to the races. Earlier this evening, after I had finished cooking, my dad called me. “Mommy says you asked her about how to make hong shao rou. You should have asked me. Okay, tell me how you cooked it.” Before I could even describe the process, he interjected, “Now, first you have to cook the pork belly in cold water.” See, my dad gets SO excited about cooking and he is SO certain that his way is the right way, but it’s quite the ordeal to squeeze a reliable recipe out of the guy. My dad really does know what he’s talking about when it comes to these recipes, but the instructions only come in an outside voice, with lots of backtracking to insert forgotten steps, accompanied by occasional self-congratulatory commentary regarding those steps that are deemed particularly genius. After a while it feels like running around in a hedge maze with a pounding headache. Also, there is a lot of laughing on both ends of the conversation. 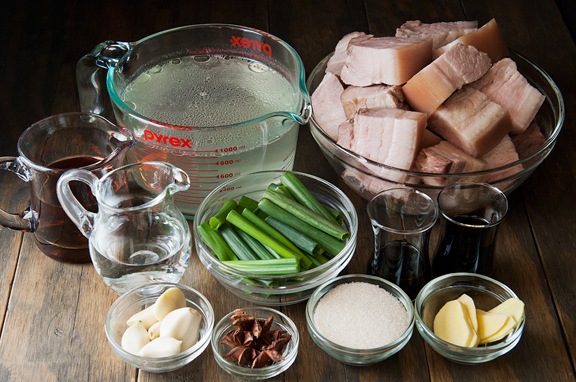 Once the pork belly is parboiled and sliced and the boiling liquid has been strained and reserved, you can get started with the real cooking. Since I used my Dutch oven, I went ahead and doubled the recipe because my Dutch oven is quite wide. 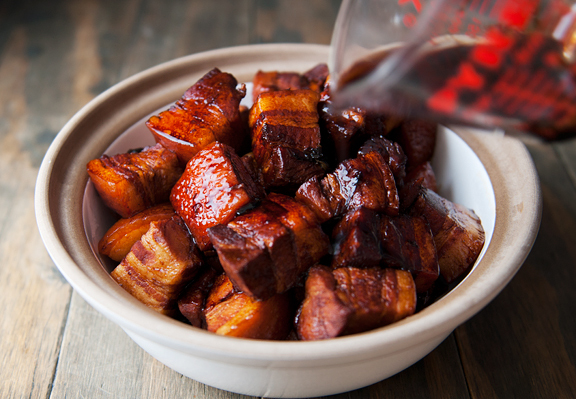 Cook a sugar syrup to a golden hue, then brown the pork belly pieces in the sugar. You definitely want to use a splatter screen because the fat on the pork belly pops and splatters and explodes when you least expect it. The next step is to add the rest of the ingredients and then bring it all to a boil. Then reduce the heat to a simmer and cover the pot. The recipe says to cook for an hour or until tender. “Until tender” was about 3 hours for me. Your mileage may vary. 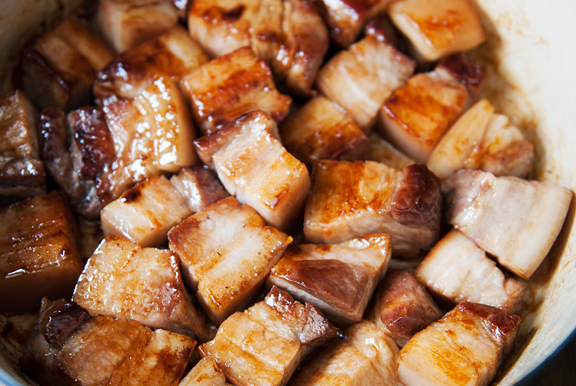 However long you cook the pork belly, be sure to give it a stir every 15 minutes or so to avoid any burning. 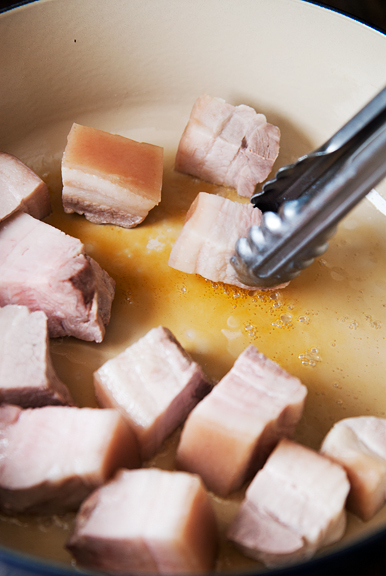 Once the pork belly is tender, but not disintegrating, remove the pieces to a bowl and reduce the sauce over medium-high heat. I reduced mine to the consistency of a thin sauce. 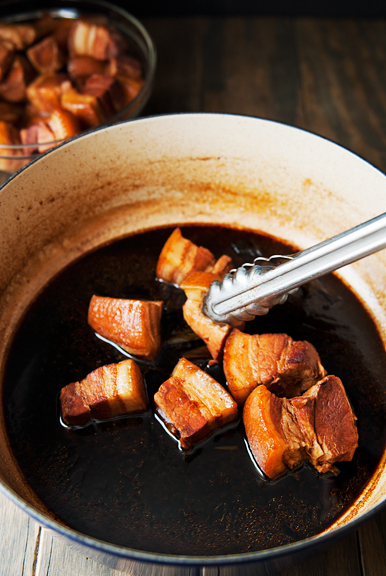 Stir in the pork belly to coat. 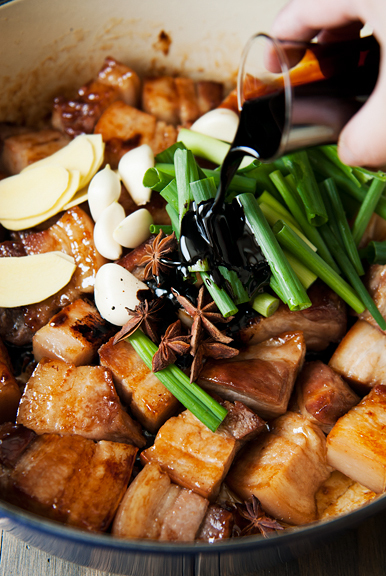 Transfer your pork belly to a dish and pour any sauce on top just before serving. 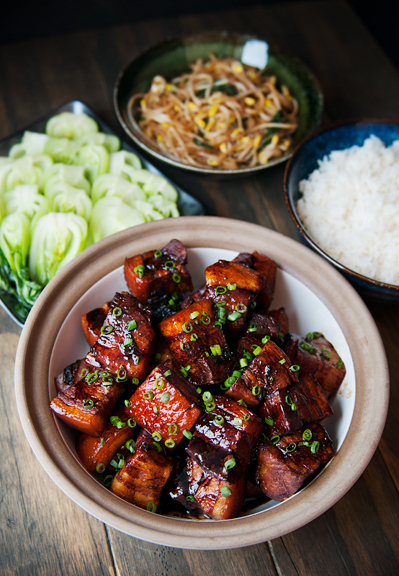 I love to eat red-cooked pork with steamed rice, or congee, or a bowl of noodles, or tucked into steamed lotus leaf buns. And the pork makes for great leftovers. The aroma wafting through my kitchen this evening reminded me of my silly childhood surrounded by loved ones, full of good food lovingly made by my elders. Chinese New Year is a time of remembrance as much as anything else. These memories bring me home. 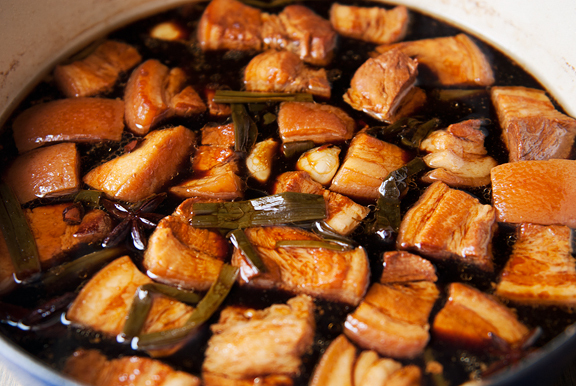 Place the pork belly in a stock pot and cover with cold water. Set on high heat and bring to a boil. Reduce the heat to medium and cook the pork, uncovered, for 20 minutes. Skim off any scum that rises to the surface and discard. 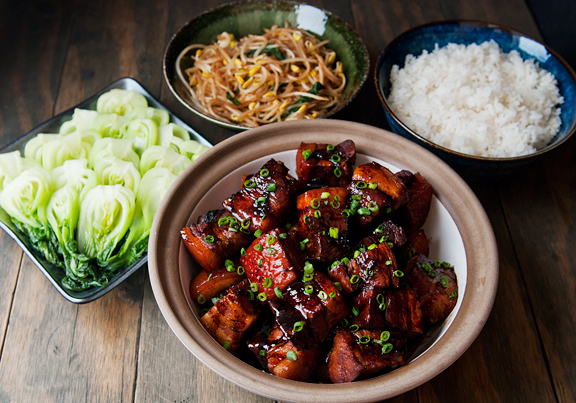 Remove the pork belly to a plate to cool. Strain the liquid through a fine sieve and set aside. 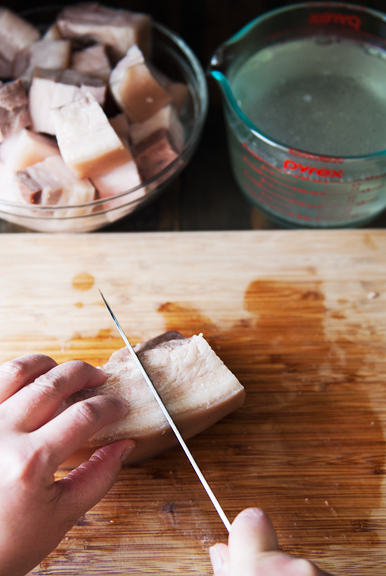 Slice the pork belly into 1 1/2-inch pieces. 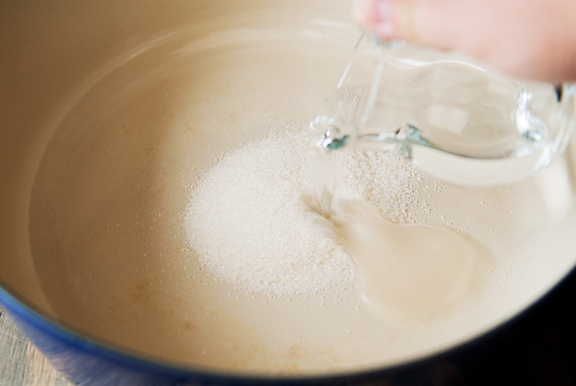 In a clean Dutch oven or a clean stock pot, combine the sugar and 3 tablespoons of water. Heat over medium flame until the sugar syrup turns yellow to golden. 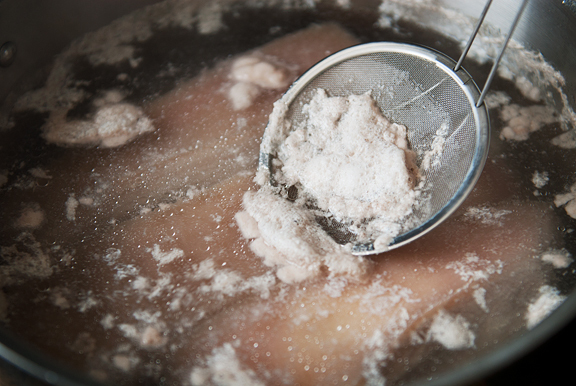 Add the pork belly to the hot sugar syrup and brown the pieces. Use a splatter guard to prevent getting burned by hot fat (it splatters). Stir occasionally to prevent burning the pork. 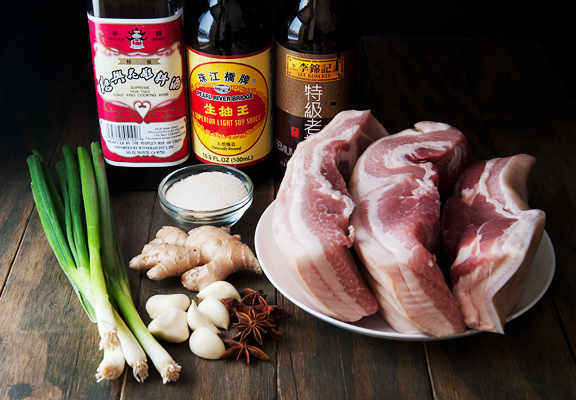 Add the garlic, green onions, ginger, anise, dark soy sauce, light soy sauce, Shaoxing cooking wine, and 2 cups of pork stock to the pork. Bring the liquid to a boil, then reduce heat to a simmer. Cover and cook over low heat, stirring every 15 minutes to prevent burning, for an hour or until tender (I cooked mine for 3 hours – much better). Remove the pork from the liquid. Turn the heat up and bring the liquid to a boil. Reduce to desired consistency (I made mine a thin sauce). Stir the meat into the sauce and serve. Serves 4-6.
this looks so delicious and glazed! and pretty sure this isn’t traditional, but i love pickled mustard greens with pork belly, so i’d probably throw some in (; i’m not planning on cooking next weekend, though hoping i can find this and other cozy, homey food anyways! Bone in pork belly? I’ve never seen that. The bones in that case would be ribs, right? What do you do with it in that form? Super curious now. This looks wonderful Jen! Also I loved your story about Dad and cooking. Some relatives it’s hard to get straight forward recipes as they, more times than not, leave out crucial steps. I was laughing while reading this exchange between you and your father! Gorgeous! And I, too, feel compelled to mention just how much I appreciate reading about your relationship with your father. It’s really quite heart-warming and I so enjoy the candor and wit with which you describe your interactions. Am still cracking up about the “outdoor voice”! Thank you for the gift of your Blog, Jen. I have the same question as Rob. Having just watched a local butcher break down an entire pig (I have half the belly minus the skin which wasn’t in the best shape to leave attached) it never occurred to me to ask him to leave the ribs attached! Live and learn. But if they are attached, then are the removed after the cooking in this recipe, or served attached? Can’t wait to try this! Even though we raise our own pigs (and beef) I’m not a big fan of pork, or any meat in general, lol. Although I cook meat almost everyday, I rarely eat it. Now, with that said, your recipe for pork bao buns, are AMAZING, one of my all time favorite foods. I mean, really, how could I have lived so long and never known about them?! So, for sure, I will be making this recipe too and there’s no doubt in my mind it’s going to knock my socks off. I can’t wait, thank you for sharing your cultural traditions. And, sigh, this east coast butterling has snow envy, thanks for the update and pictures once again. Rob – Me neither, but I’m guessing you’re right. I think the purpose is to add more flavor to the broth (I’ve only seen the “bone-in” option on a recipe I found on NPR). I know that the version my folks made when I was a kid was a bone-in pork shoulder and the broth was heavenly on noodles and rice (I didn’t even care about eating the meat). MK – Thank you, emotions in my family are never lukewarm – we are always laughing or yelling or both! kelly – I think it’s fine without the bone as the only recipe I really found that mentions it was this one (from NPR): http://www.npr.org/2014/09/18/348972277/the-secret-to-this-melt-in-your-mouth-pork-is-in-the-soy-sauce – also? I am SO jealous of your pig acquisition! I think you might lose the bone during the cooking phase (it might come off) or you could leave it on. I think the only difference would be that you couldn’t cut the pork into little cubes if the bone is left on. So yeah, maybe the bone would/should come off the meat on its own after a couple hours of braising?